Principal Kevin Creutz awaits the official groundbreaking. Two major additions to the school campus will be constructed in 2016/2017. One will be a full size gymnasium that has been on Central’s ‘wish list’ for almost 30 years. Previous campaigns didn’t raise enough financial support to make it happen, but this time around the capital campaign raised enough not only for the gym but also for a new early childhood center as well as some remodeling of the existing classrooms. The preschool plans to open by the 2017/2018 school year and will allow Central to double its capacity and feed the successful K-8 grade school. 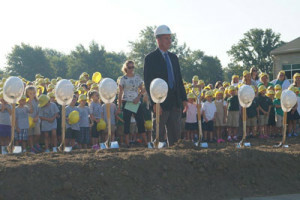 The preschool and grade school will also now be physically connected on the same property allowing for a smoother transition to the grade school. 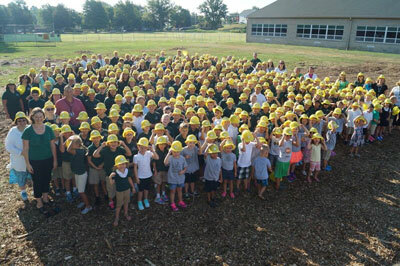 Central Lutheran students await the groundbreaking in their own hard hats. Students participated in the historic groundbreaking ceremony by wearing some yellow ‘hard hats’ while Principal Kevin Creutz, School Board chair Troy Smith and other members of the school board and capital campaign team grabbed silver shovels and dug into the pile of dirt just outside the construction zone. When completed the gymnasium and early childhood center will include new construction of just over 35,000 square feet. Weigand Construction and Design Collaborative, both of Fort Wayne, are serving Central Lutheran as contractor and designer for the project. The capital campaign has received pledges of over $6.3 million to date with pledges still coming in. This represents more than three times what Central Lutheran has ever raised in previous campaigns. Steve Siegel was the campaign consultant representing Ward, Dreshman & Reinhardt.